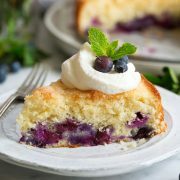 Sweet and tender Blueberry Cake! This is made with frozen blueberries so you can enjoy this tempting treat year round! It has a moist and delicious crumb and a perfectly satisfying flavor. Perfect for a weekend breakfast or after dinner dessert. If I could eat this cake every morning for the rest of my life I most certainly would die happy. Okay, almost :). I’d highly, highly, highly (yes it deserves three of those) recommend this cake. 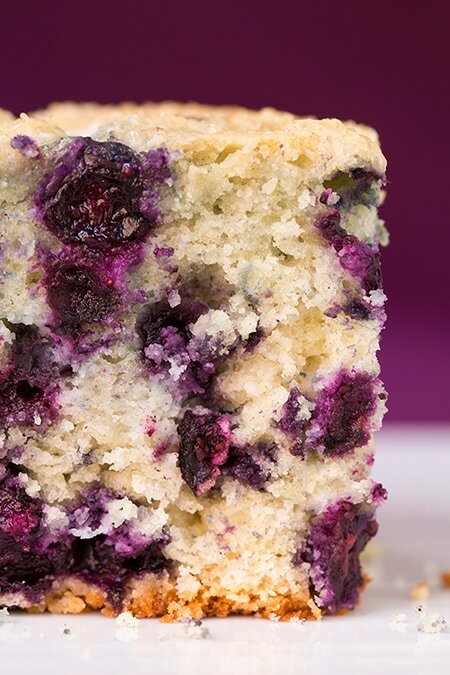 It’s basically a moist, fruit loaded, sugar coated blueberry muffin in a simple cake form. Anything with blueberries is basically the best dessert ever to me (or with chocolate or browned butter or caramel, okay I have a lot of favorites, I know). I could nearly live on blueberries. They are always a go to snack at my house. 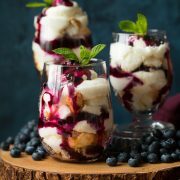 Seeing that blueberries aren’t in season right now and I just happened to have a big bag of them in my freezer I decided to make a recipe with blueberries that I can make year round, using frozen berries. This did take some time to bake since the berries go straight into the batter, then into the oven frozen but I’m telling you it’s worth the wait. Someone needs to get it out of my house so I’ll stop going back for more. With it’s tender crumb and slightly crunchy and caramelized top (thanks to the raw sugar) this will likely become a recipe you’ll want to hang on to. 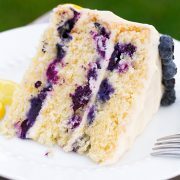 If you’d like you could also add 1 tsp lemon zest or 1/4 tsp ground cinnamon and a pinch of nutmeg to the batter, I don’t think it needs it but if you want a hint of lemon or spice it would be a nice compliment to the blueberries. Enjoy! Preheat oven to 350 degrees. In a mixing bowl whisk together 1 3/4 cup of the flour, the baking powder, baking soda and salt for 30 seconds, set aside. In the bowl of an electric stand mixer fitted with the paddle attachment, whip butter, granulated sugar and 1 Tbsp vegetable oil on medium-high speed until pale and fluffy. Stir in remaining 2 Tbsp vegetable oil. Blend in eggs one a time, mixing until combined after each addition and adding in vanilla with second egg. In liquid measuring cup used to measure buttermilk, whisk together buttermilk and sour cream. Working in three separate batches add 1/3 of the flour mixture and mix just until nearly combined, then alternate with buttermilk mixture and mix just until nearly combined, repeat once more then end with flour mixture mixing just until combined. 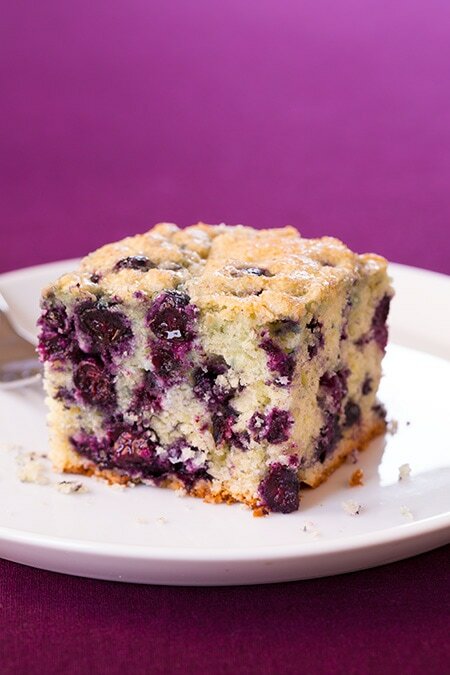 Toss frozen blueberries with remaining 2 Tbsp flour then fold into batter. Pour batter (it will be very thick and cold) into a buttered 8 by 8-inch baking dish and spread into an even layer and sprinkle top evenly with raw sugar. Bake in preheated oven 55 - 60 minutes, or until toothpick inserted into center of cakes comes out free of batter and tent cake with foil near last 15 minutes of baking to prevent excessive browning of top. Allow cake to cool on a cooling rack then cut into squares. Store in an airtight container. *Fresh blueberries would work fine too. If using fresh reduce the baking time by about 10 - 15 minutes. Michelle: Just starting cooking from your website…so far, so awesome.